Scary Pumpkin Stencils - Ooooohhhh! Here are scary pumpkin stencils that you can use to carve a pumpkin (or paint a pumpkin if you don’t want the mess of carving) and to decorate in many other ways for you Spooky Halloween Event. If you are looking for scary pumpkin stencils to carve a Jack-O-Lantern, then this one is Gonna Getcha’. Watch out for those grabby claws and the bushy eyebrows that can’t seem to hide his bulging eyes. Just print him out and then slither on over to the Pumpkin Carving section for a step by step plan on how to carve your own pumpkin complete with pictures. Don't miss the Halloween craft idea video at the bottom of this page! Well this is just one out of four of the free Halloween stencils that you will find on our Free Pumpkin Carving Stencils section. Don’t miss the Scary Cat, The Witch and the Skull too. OK...If you’re like me you might only carve a real pumpkin once. The mess and work is ... Well, let’s just say once was enough for me. Not to worry! I have a great idea that is much easier, no mess and best of all you’ll end up with a Jack-O-Lantern that will last year after year. Yeah - that’s right! Next year you can just fish him out of the attic, put him on the porch and start handing out candy. I painted this stencil on a white craft pumpkin (isn’t he cute). I’ll tell you all about it at Halloween Pumpkin Stencils . 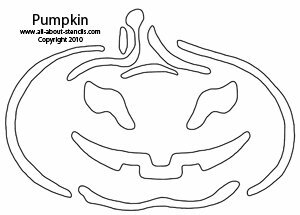 However, if you don’t feel like it’s Halloween unless you are carving something then I can tell you how to use the free stenciling patterns to cut the pumpkin at Pumpkin Crafts. You may even have time left over to make some treats using Cookie Stencils (don’t miss the article on creating scary cookies). Cookie Stencils (don’t miss the article on creating scary cookies). Maybe I misunderstood and you aren’t looking for scary pumpkin stencils to use for your Jack-O-Lantern but wanted scary pumpkin stencils to decorate a Trick or Treat Bag or maybe decorations for the windows. Well here you go. Again, just print him out and go. 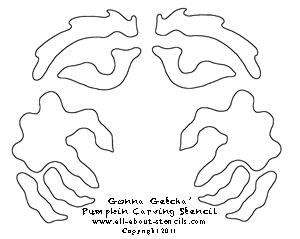 Don’t miss out because we have more Free Pumpkin Stencils like this one. There are many ways to have fun with Scary Pumpkin Stencils! We are thrilled to introduce our selection of downloadable Stencil Designs. Instant gratification at its finest! You don't need a special printer - these designs are specially formatted to print straight from your home computer on standard letter sized paper. Once downloaded, you will have your complete stencil booklet with patterns and instructions. Just click, buy and print! The book below has a Halloween theme that I think you might like. Each book will come to you as a downloadable pdf file in your e-mail. Just check your e-mail after purchase for the link to connect to your file and print or save. It's that easy! Create your own costume with these 4 fun masks - a Witch, a Skull, Frankenstein's Monster and a Black Cat. This purchase is of a downloadable PDF file with 32 pages. All designs can be adjusted to fit. Instructions are included. Check your e-mail after purchase for the link to connect to your file and print or save. It's that easy! And hey! Don’t forget that I (and everyone else) want to see what you have done with your scary pumpkin stencils. Just click on Stenciling Projects to get your masterpiece showcased here on this web site. Won’t that be exciting! Or if you have any questions or want to share information join in on the Stencil Blog. Well, I hope to hear from you soon. P.S. 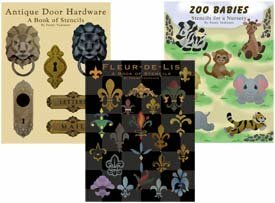 If you’d rather get your Stencil Pattern Books in Print, then visit our Printer’s Book Shop for stencil designs in book format that will be mailed to you. You’ll find all of the stencils used as examples throughout this site. OK! Here's that Halloween craft ideas video I promised you. Enjoy! Return to Home Page from Scary Pumpkin Stencils. Return to Halloween Crafts from Scary Pumpkin Stencils. Here's a quick list of links to all of the Halloween Crafts! Pumpkin Crafts - See how to carve a Craft Pumpkin for a no-mess forever Jack-O-Lantern. Pumpkin Carving - Learn how to carve a Pumpkin with Stencils. Cat Stencils for Pumpkin Carving - Free Stencils. 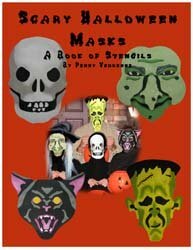 Halloween Masks - Get some great tips for creating Halloween Masks and Costumes starting with Stencils. Halloween Cookie Stencils - And the Recipe too! Halloween Crafts - Here you'll find the tid-bits on All the Halloween Crafts. Halloween Pumpkin Stencils - And they're Free! Jack O Lantern Stencils - More Free Stencils. Printable Halloween Masks - Find a Free Printable Mask. Pumpkin Stencils - Free Stencils and watch a video for ideas. Scary Pumpkin Stencils - Free Scary Pumpkin Stencils. Skull and Crossbones Stencil - You guessed it - It's Free! I hope you enjoyed all of the Halloween Crafts that you found here. Come back soon for all of the Christmas Crafts!